I kind of dissapeared for a little while, this is me guys .. I post 4 times in a week or I vanish like a ninja lol. I've been working a lot on my mum's ice cream shop project and the good news is, it's almost complete. The last details such as curtains, the tables and putting all the little pieces around that I did for this shop and it's going to be finished. It looks good so far. I may be posting some pics of it in a week or so. I'm quite happy about the way the muffin's swirl came around ... I was experimenting with ways of avoiding the frustration of using the cake decorating tip -_-"". If you guys would like to know more about the "swirl experiment", let me know by leaving a comment. Second piece I completed today; a pie safe. I restored it to look as a 16th century one. A bit of history: "The pie safe was used to store not only pies, but also meat, bread, and other perishables, protecting them from vermin and insects, the Dutch introduced it in the 16th century to the US and it was used till the 19th century." And at last, I added some sweets, it's a pie safe after all! More pieces on the way, I have many laying on my table (the usual thing) waiting to be finished. Que bonitos se ven los dulces de halloween!!! Si que me gustaría saber como has logrado ese efecto remolino!! 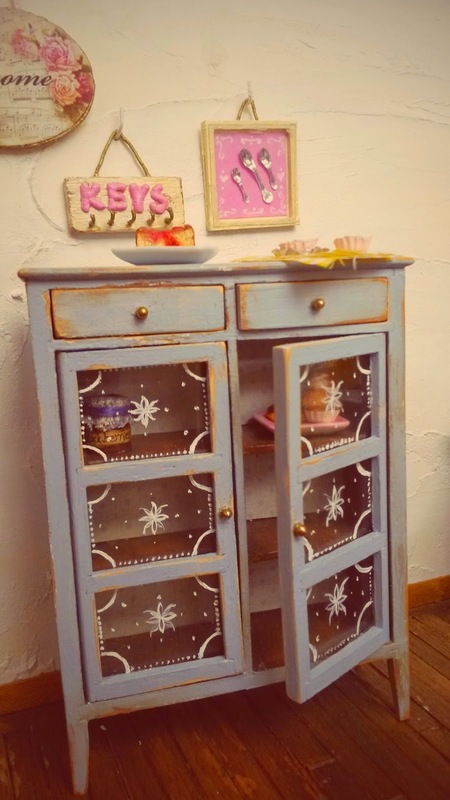 El mueble es bello y más con la decoración que le has puesto,me encanta!!! Besos querida! que estes muy bien! The pie safe looks fabulous. I love the "Halloween" table with everything on it. grateful if you share it with us. The swirl came out looking good, I'm going to do a tutorial on how to decorate with "clay creams", how to do icing, frosting effect and more. Wonderful pie safe, Ann, I really like the idea that you took an "artistic license" (I love to do this too, as you can see on my blog) with the flower motif ;)! Just like Elizabeth, I am curious how you achieved the "swirl" on the cupcakes. It seems to me quite difficult to make a perfect one, but you did ;O! I'm going to do a tutorial about decorating mini sweets so that all of you can do it as well, the cake decorating tip is really good in certain cases and not all. I like your wonderful pie safe. The Halloween table is amazing. 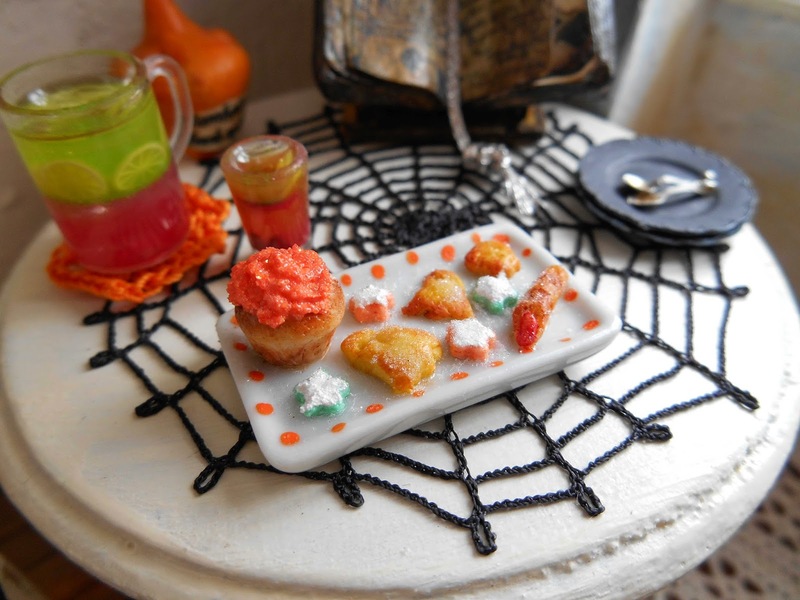 Yummy treats for the season! The pie safe is wonderful work! This is so sweet! And the pie cabinet is so gorgeous. By the way, did you get my package? You never told me.